Sometimes, feelings lie too deep for words. 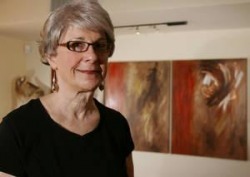 When Janie Cohen underwent radiation for skin cancer, and when disappointing results led to other treatments, she dealt with her pain through art. The 62-year-old Foothills resident is in remission, and a series of paintings from her journey through darkness — the “Renewal of Spirit” series — hang in the Arizona Cancer Center. Cohen found out that she had cancer in 2003. The doctors had to take a piece of skin six inches in diameter from her thigh and graft it onto her head. She endured radiation treatment, but the cancer returned. After 10 more removals of tiny cancerous spots and more radiation, the cancer still returned. It was during a radiation treatment at University Medical Center that Cohen laid eyes on an advertisement for a healing arts class. Three decades earlier, she had written a book about using art as therapy for the developmentally disabled. She knew its benefits. In a gentle environment with soothing music and inspiring stories, the longtime painter drew a mouthless self-portrait titled “No Voice.” Nobody had asked her if she wanted cancer. Nobody had given her a chance to turn down its disruption of her life. The portrait spoke more than words. When the healing arts class ended, her feelings didn’t. So she continued one-on-one lessons with the instructor, often striking canvases as if they were punching bags. “My goal was to just smear paint to get the frustration, anger and terror out,” Cohen said. All the smearing and slapping helped Cohen at first, but as she worked through her grief at being sideswiped by disease, this style of painting began dragging her down. One day, she found a good price on canvasses, and she decided to buy a bunch and use them to create something uplifting. “It hit me that this was a renewal of myself,” she said. At about that time, Cohen and her husband set off for the M.D. Anderson Cancer Center in Houston in a last-resort effort to keep the cancer from metastasizing. The first treatment did no good. The next, biotherapy, helped. In Houston, Cohen thought often about what would become her “Renewal of Spirit” painting series. Back in Arizona, she worked like mad to complete it. “I quit doing the dark works that represented death to me and started doing trees that represent life,” she said. The canvasses stand at 2 square feet and have swirling backgrounds evocative of the cosmos. Each contains two small squares that contain trees and cacti. Some stand barren, some have leaves, some have thorns. All are imperfect. All represent life. “It’s true, if you look at a straight branch, it’s not nearly as interesting as a curly one,” Cohen said. As Cohen worked on the series and, thus, on her grief, she found herself choosing brighter colors for each successive painting. But she never kicked her urge to give each a bit of discordant blue. Nine months in remission, now, Cohen talks about the insights she has gained from struggling with cancer. Likely, some people who walk through the Arizona Cancer Center will pause and hear. © 2009 Janie Cohen, All rights reserved.